Content design allows you to showcase your website content in a simpler, clearer, and quicker way. You can do so by taking user stories as your basis: as (who) I want to (what) so that (why). Recently, we wrote about the origin of and the reason for content design. In this article, you’ll find a few practical tips to get started on your own website content. You might be used to considering your website’s content based on pages, with the homepage as your logical starting point. But actually, that is no longer the way people find your website. Google and voice search are increasingly popular ways to discover content. The content you present should originate from a starting question, a user story: as (who) I want to (what) so that (why). It’s entirely possible that these stories are already scattered throughout your website. Identify this content and group it into individual stories. #2 What is the follow-up action? Next, for every user story, consider what a user’s next point of action might be. It could be a response to a call-to-action (submitting an e-mail address, liking something on social media, buying a product, getting in touch), or a completing a related action (clicking through to a next user story). For each user story, think of minimum 3 possible follow-up actions. TIP: Sometimes it helps to visualize all stories offline. For example, on colored post-it notes. It’s an easy way to keep a clear overview. The solution: include W as a click-through option on all related stories. As a writer, you often know quite a lot about any given topic. It’s tempting to show off all your knowledge in a piece of content. But that’s not helpful to a reader who might be scanning your text. It also makes it harder for your designer to turn your article into an attractive page. For those reasons, stick to the main topics first. Ask yourself if any subtopics might be better suited to their own user story. An easy way to do this is by limiting paragraphs to a maximum of 6 lines. That makes it much easier to focus. A user story will often have some kind of hierarchy. Make that structure clear by adding descriptive titles and subtitles. Don’t forget to add the H1 to H3 tags (H1 is for your article’s title). That makes it a lot easier for the designer to incorporate the hierarchy in the design. Are you noticing that a story needs even deeper layers (H4/H5/H6)? In that case, it might be better to split your content into multiple stories instead. One of the benefits of using content as your starting point is that you won’t be bound to a specific topic. On many web pages, you’ll find an image at the top that doesn’t really add any context or value, like a generic stock photo of smiling people. As you write, take the time to decide whether your text needs visual support, and if it does, carefully consider what that should look like. Well-formulated user stories and Google search queries have a lot of overlap. This is precisely the information your target audience is looking for. It would be a shame if your (potential) clients and users can’t find your website due to poor search engine optimization. That’s why you should keep SEO best practices in mind while you’re writing. Are all the writers in your company knowledgeable about (the latest trends in) search engine optimization? If not, consider using a system that will give you real-time advice about your content’s SEO as you write. 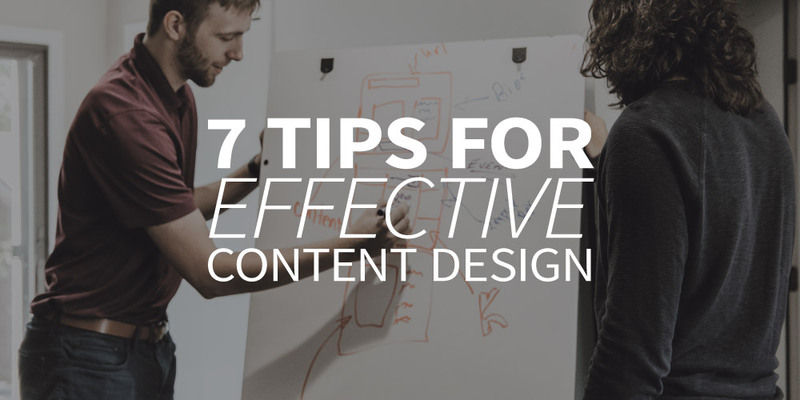 Content design is all about finding the essence. That’s why it’s helpful to let a few other people (coworkers, but definitely also your target demographic) take a look at your user stories. Also a good idea: step away from your written content for a week or so. Looking it over again for the second time, it will be easy to notice any missing points or areas that need some clarification and cleaning up.